Deposits must be received within 21 days of booking your trip! $500.00 / Black Bear & Small Game hunter (refunded at our discretion) Balance due 60 days prior to arrival. $1000.00 / Moose hunter (refunded at our discretion) Balance due 60 days prior to arrival. Only one deposit will be applied to each guest. Although deposits may be transferred to a person replacing the original guest or a later date available in the same year. Reservations will not be guaranteed without the proper deposit. Cabin size is determined by the number of deposits received. All prices* are in U.S. Funds. Packages are subject to HST (Harmonized Sales Tax 13%) when not already included in the package price. We do allow friendly pets with some restrictions. $75 per stay. Please inquire. Final Payment – cash, cheque, traveler cheque. Guests are responsible for all damage or loss to all property & equipment. Preferred cottages may be requested but we do reserve the right to substitute when necessary. Extra Days or Short Stays are welcome when available. arrive in our main camp Saturday at 5:00 pm. Pick up from the outpost the following Saturday 6:00 am. Early arrivals will be charged an additional fee. We practice CATCH & RELEASE on all Slot Fish! Our mail is forward to our winter address in Dryden. Please expect mail to take between 3-4 weeks to cross the border. We will confirm your reservation with an email reply after receiving your deposit. Remember postage to Canada is more than one stamp. Can’t get away for a full week? No problem we book short stays. Contact us and we will create a trip for you! Trophy Time! Open water to May 19th. Northern Pike & Lake Trout Special Save 10% for early season Pike and Lake Trout! We do limit the number of groups at this time of year. Walleye Opener May 18-25 – main camp guests – arrive Friday night and be on the water early Saturday. Savings of over $300. Woman Lake Outpost guests arrive 10 am on Saturday! Loyalty Discount- 5% off for any guest who has been to Woman River Camp in the past two years! Thank you! Group Discount 10% off for full paying adult guests in a group of 4 or more in the same cabin. A boat on a lake, fishing. Is there a better place to bond? Family Packages and Short Stays check out Fishing Rates. Discounts max out at 20% with the exception of the referral discount. 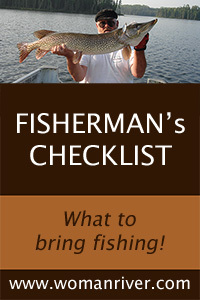 Discounts are only applied to Fisherman and Outdoorsman Packages.